Aloo aur hare pyaz ki subzi has been frequent winter subzi in my kitchen and the recipe has not changed ever since I started cooking it. It is actually the exact same recipe as my mother used to cook and we both love it immensely. Hara pyaz is the same spring onions we get fresh in the markets as soon as the winters start in North India. This is one green leafy vegetable that is always there in my fridge. More so in recent times when the husband has started carrying a lunch box to office. He loves aloo aur hare pyaz ki subzi and it gets ready within 10 minutes, doesn't make the lunch box messy with a gravy and tastes great even when cold. What more I would wish for? Oh and it makes a standalone breakfast dish for me sometimes, may be with a boiled egg on the side. Yes, potatoes and eggs, both are life savers. It is great if you have boiled potatoes in the fridge, otherwise just boil them in the microwave or whatever way you prefer. Cold boiled potatoes are suited for this recipe best, but you can go ahead with freshly boiled potatoes as well. Heat the oil in a pan and tip in the cumin seeds, wait till they crackle. Then add the chopped ginger and green chilies wait till they are fried but not dehydrated, add the cubed potatoes, turmeric powder and salt at once. 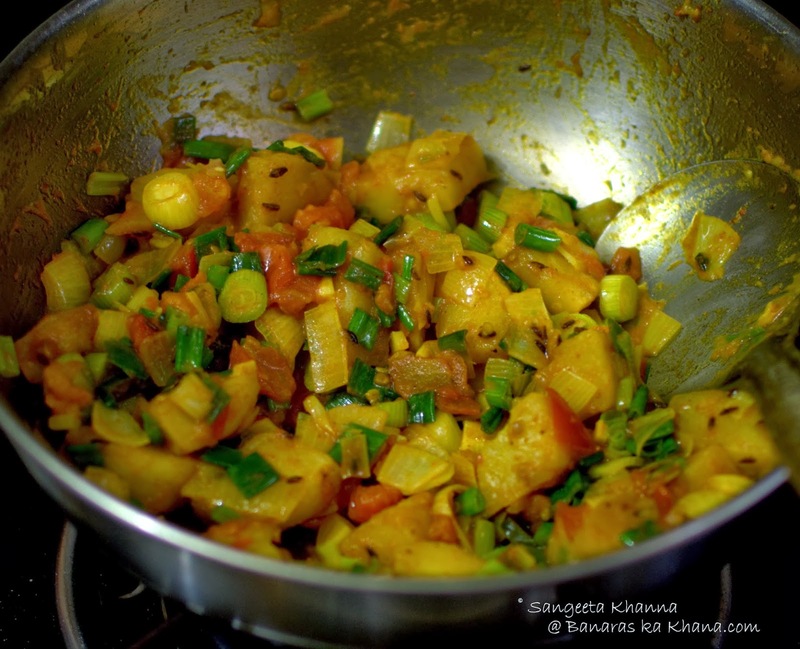 Mix well and stir fry till the potatoes are coated well and slightly pinkish at the edges. Add the diced tomatoes, mix and cook till they get mushy, it takes about 2-3 minutes. Add the pepper powder and chopped greens of spring onions and just stir and cook till the greens get wilted and mixed well with the potatoes. Looking like the picture. Do not cook after adding the greens for more than a couple of minutes. 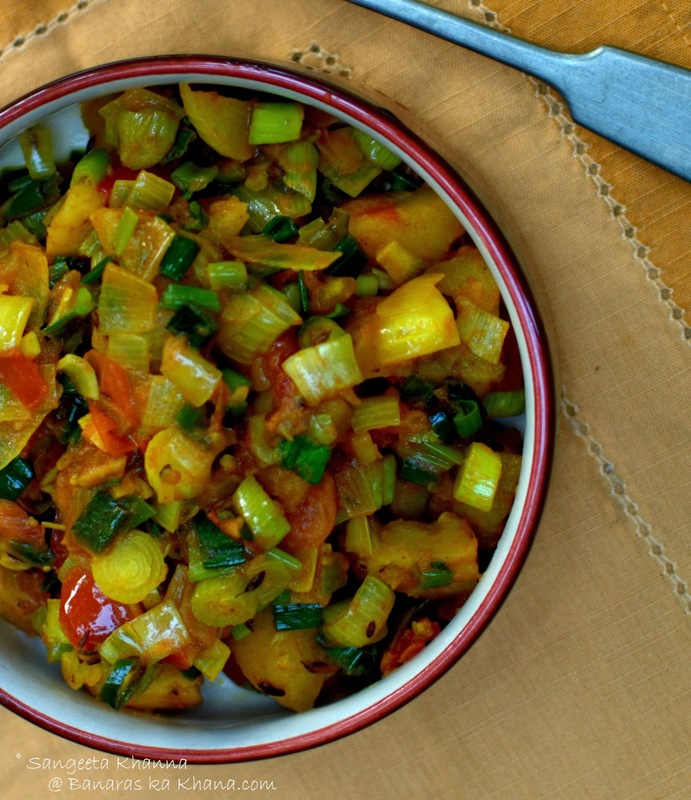 You might like to add a pinch of amchoor powder in this stir fry or sookhi subzi. Or may be some red chilly powder too sometimes. Adjust seasoning when the subzi is still in the stove and mix well. Serve hot or cold, the subzi tastes great with just anything. As sandwich stuffing, as a paratha stuffing or just as it is like I do. 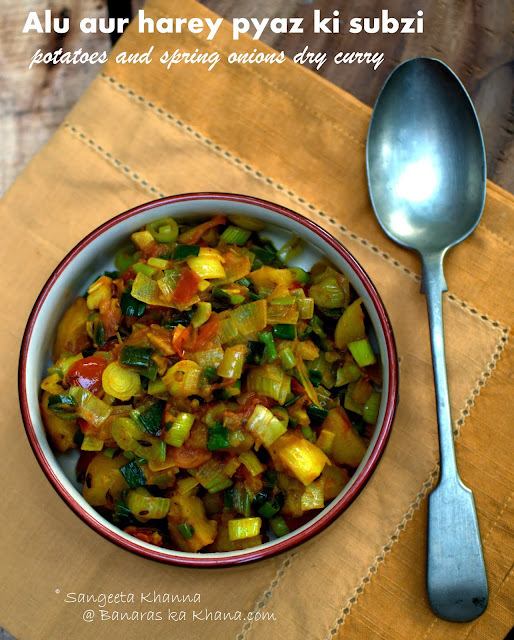 Make it spicier and it suits a plain daal chawal or khichdi meals well, just with a side of a raita or nothing I say. Simple home cooked meals are very much doable on a daily basis. Stop eating your lunch in the office canteen and ordering your diner every day. Would you? Delicious looking sabzi...never tried this with green onions.. Simple and delicious. Thanks for sharing this recipe. Why only the green part of the hare pyaz?? No particular reason K but using the bulbs will dilute the green flavour of the spring onions I feel. I like the greens more, you can include the bulbs too and see how you like it.